MONTELLO, Nevada — A broken dam in Elko County, Nevada, flooded farmland and homes in the community of Montello, stopped Union Pacific trains nearby and prompted a warning to people in extreme northwest Utah to avoid the rural highway into the Silver State. Feb 8th, 2017 -And while Utah has recently experienced a quick warm-up after heavy snows, state water officials think a similar breach is unlikely in the Beehive State. The National Weather Service reported Wednesday the failure of the 21 Mile Dam was sending water spilling out in a "dangerous and life-threatening situation." "Water in the reservoir continues to rapidly empty and is heading downstream. Ongoing flash flooding will continue and could potentially get worse," the National Weather Service advised. A flash flood warning for Elko County has been issued through midnight Thursday. As the water flows into the Dake Reservoir, there is a risk the dam there could overflow leading to more flooding, according to the warning. Union Pacific rail traffic in the area has also come to a halt, Justin Jacobs, a Union Pacific spokesman for the area, confirmed. Trains headed toward the flood-affected area have been stopped and face indeterminate delays, Jacobs said, while Union Pacific is assessing options to re-route trains that are further out. It was unclear whether freight or commuter trains, or both, were being impacted, Jacobs said. And until the water stops flowing, Union Pacific will be unable to inspect the tracks and see just how much damage has been done. Fast-flowing water through the streets of Montello, an unincorporated community in Elko County in northeast Nevada, had emergency crews responding to set up sand bags around homes and businesses. Footage captured by KSL-TV's Chopper 5 shows wide breaks in the earthen dam, water rushing along rail routes and trains stopped on the tracks. Kevin Hall, a captain with the East Elko Fire Protection District, said the flooding and the breach are due to heavy runoff and snowmelt. Earlier in the day responders were dealing with just a few inches of water, but since the dam failed it has risen to a few feet in depth, he said. "We've got about 3-foot trenches down in the front of the businesses now that it's washing out along the pavement," Hall said. "We've got a fuel station, a gas station here, and we're trying to protect the pumps from fuel contamination into the water, which causes big problems." Hall said areas of Nevada's state Route 233 are also at risk of washing out and warned drivers out of Box Elder County to stay away. "Do not travel it, it's getting dangerous," Hall warned. Damage to California's Oroville Dam concrete spillway this week has forced state engineers to consider alternatives to release water as new storms come into the Northern California region. Thursday, 9 Feb 2017 - The damage also raises questions about the state's aging infrastructure at a time when President Donald Trump is talking about increasing U.S. spending on infrastructure. Oroville Dam, completed in the late 1960s, is California's second-largest reservoir. The lower half of the spillway has concrete erosion, creating a gaping hole in a structure that is used for controlled releases of water. The reservoir's water levels were almost full on Thursday and the state was determining how it would do new water releases. Speaking to reporters Thursday, a state official said there was no cost estimate for repair work. The erosion was discovered Tuesday and initially raised safety fears for residents in Oroville that it could present a larger problem for the dam. However, officials from the state's Department of Water Resources insisted this week there's "no imminent threat" to public safety and said they are looking into "ways to bolster and protect the spillway." Federal dam inspection officials were onsite Thursday and participating in the damage assessment. Officials were using drones to monitor the situation but stressed that the damage was not to the dam itself. "The spillway is necessary to maintain reservoir operations, given the immediate forecast of continued rain for the next two days and also in preparation for the remaining runoff season," the DWR said Wednesday. According to the National Weather Service, the Oroville area — about 70 miles north of Sacramento — is forecast to get 2 to 4 inches of rainfall in the next 48 hours. The same storm system is bringing precipitation to other parts of Northern California. The spillway damage follows a series of storms to hit Northern California, producing rain and snow in the Sierra Nevada mountain range. Oroville Dam is located in the foothills of the western Sierras. Engineers conducted two test runs with water flows on Wednesday, checking to see if the spillway can handle the strength of about 20,000 cubic feet per second of water. As of Wednesday, the crater in the spillway was estimated to be a 200-foot-long strip. Officials said Thursday the cavity and erosion had grown substantially after the test releases. "We're trying to determine if the spillway is not usable do we need to use an emergency spillway," Maggie Macias, a spokesperson for the DWR, said Thursday. She said using the Oroville emergency spillway would be the state's "last option but not our favorable option because it's a hillside and not a concrete structure." The emergency spillway has never been used before. Oroville has a capacity of 3.5 million acre-feet of water at around the 900-feet elevation. After so much water accumulated, but with previsions all pointed to dryness - nobody seems to cared to attend to safety issues in case of flooding - the structural damage is inevitable - . Yet, denial goes on: maybe this is why preppers and preparation were ridiculed or impeached. The PTB has no answers, nor plans, no concern. The California Government assured the citizens that the emergency spillway would not be used in the lake overflow as Oroville Dam's concrete spillway collapsed due to structural failure at 65,000 CFS release. Now with the lower hydroelectric facility discharge out flow clogged with debris there will be +12,000 CFS flow over top and also authorities will scale back flow from collapsed spillway to 35,000 CFS from 55,000 CFS which means and extra 32,000 CFS will pour over the untested emergency spillway. THOSE IN THE DRAINAGE BASIN OF THIS DAM NEED TO PREPARE TO POSSIBLY EVACUATE. IF THE ORDER IS GIVEN YOU WILL HAVE LESS THAN 30 MINUTES TO LEAVE. PREPARE NOW. Thanks for the video, Shared Joy. Their denial has now turned into a life threating emergency. The city of Oroville and all of Yuba County in California have been ordered to evacuate as the Oroville dam's emergency spillway is predicted to fail imminently. The combined population of the areas under evacuation would appear to reach nearly 100,000 people. The California Department of Water Resources is ordering residents to evacuate northward. Social media accounts report traffic jams as people try to get out of harm's way. On Tuesday, a huge hole formed in the spillway of the dam, which officials fear will grow until it hits bedrock. The dam's emergency spillway was then put into use, but severe erosion meant that officials are not sure it will be able to hold. Though officials described the situation as stable as recently as this morning, they are now urging residents in low-lying areas to leave, BNO News reports. The dam is the nation's tallest, and California's second largest reservoir. Officials had been expecting a problem for days, but had hoped to avoid using the emergency spillway, the Chicago Tribune reported yesterday. This is the first time in the dam's nearly 50-year history that the emergency spillway has been used. ​Water began flowing over the emergency spillway — basically a route quickly cleared of brush to allow water to be released in a somewhat controlled fashion — for the first time in the dam's history on Saturday. The fear is that erosion in the emergency spillway could cause an uncontrolled flow of water. OROVILLE, Butte County — Butte County residents near Lake Oroville, including the entire town of Oroville and nearby regions, were ordered to evacuate Sunday evening after the emergency spillway next to the reservoir’s dam suffered a possible structural failure, officials said. “There has been severe erosion of the emergency spillway and a possible structural breach that could send uncontrolled water down the stream,” said Chris Orrock, a spokesman with the California Department of Water Resources. Residents downstream from Lake Oroville to the Sutter County line were under mandatory evacuation order. Counties around the reservoir, the second largest in the state, down to Sacramento were warned about the possibility of flooding. Officials increased water releases out of the primary spillway to 100,000 cubic feet per second to relieve pressure on the emergency spillway. An evacuation shelter was set up at the Silver Dollar Fairground in Chico at 2357 Fair St.
Traffic was bumper to bumper as residents of Oroville, Biggs and Gridley headed slowly out of the possible flood zone eastbound on Highway 162. The amount of water gushing over Lake Oroville’s emergency spillway had begun to decrease before the emergency Sunday as state officials pushed ahead with urgent measures to make room in the state’s second-largest reservoir. The emergency spillway — an open hillside that drains to the Feather River below — had never been used since the Oroville Dam was completed in 1968. The discharge that began early Saturday raised concerns over how the backup channel would hold up, and whether debris would threaten fish and levees downstream. The primary concrete spillway just south of the overflow area, meanwhile, was thought to have stabilized after a gigantic hole emerged in its 3,000-foot-long channel last week. The gash forced operators to reduce the outflow, which set the stage for this weekend’s unprecedented situation. Another wet-weather system, in what has been a soaking winter, is on deck to hit Northern California on Wednesday, requiring water managers to make still more room in Lake Oroville for another surge. The series of Pacific storms is expected to bring up to 4 inches of rain to parts of the Central Valley, said Idamis Del Valle, a meteorologist with the National Weather Service’s Sacramento office. Teams were dredging an area composed of silt, rock and hunks of concrete debris that has formed under the primary spillway following recent erosion. The blockage forced water in the diversion pool to back up toward the dam and has threatened the Edward Hyatt Power plant at the base of the concrete behemoth. The power station, which was closed late Friday due to the threat, serves as a third release point for the reservoir when it is operational. The facility expels up to 14,000 cubic feet of water per second downriver. Officials had stressed earlier Sunday that the structural integrity of the 770-foot Oroville Dam — the tallest in the country — had not been compromised by the damaged spillway. Once the dredging is completed, crews must rewire overhead power lines that were taken out of service after support towers were threatened by erosion. Operators first detected the hole in the primary spillway Tuesday. Subsequent releases down the slide made the hole grow dramatically, exposing bedrock even beyond the 180-foot-wide channel. Officials stabilized the hole and stopped further erosion by slowing the outflow to 55,000 cubic feet per second. But 90,000 cubic feet of water per second continued to dump into Lake Oroville and pushed the reservoir over capacity on Saturday. By Sunday, the rate of inflow had fallen to 41,400 cubic feet of water per second, officials said. The estimated cost of repairing the concrete spillway has soared to as much as $200 million, and officials are debating whether it can be patched when the rains end, or if a new chute will be needed altogether. Under clear skies, many residents from nearby communities headed to Oroville on Sunday in hopes of seeing the raging Feather River or the damaged spillway. They parked and walked along streets overlooking the murky water, but public access to the spillways next to the dam was blocked. The reservoir is the second largest in the state behind Lake Shasta and supplies water to Central Valley along with districts in the Bay Area and Southern California. On Sunday, the cause of the hole in the main spillway was still being investigated. But experts noted repairs had been made to the spillway in 2013 near where the hole emerged. Robert Bea, a U.C. Berkeley engineering professor, reviewed 2015 inspection reports that made note of the earlier repairs to the concrete slabs. “From what I can tell from the photographs, it appears that the water pressures from the recent releases were great enough to cause failure of the repairs made to the base slabs,” he told The Chronicle. Downstream from the dam at the Feather River Fish Hatchery in Oroville, officials with the California Department of Fish and Wildlife had moved nearly all their salmon hatchlings into nearby holding ponds due to brown and silty water that threatened the fish. Highway 35 in Los Gatos is shut down, a portion of the roadway at Las Cumbres Road is gone. Highway 35 has been completely washed away near mile marker 10.47 in Santa Cruz County, according to the California Highway Patrol. A massive chunk of Highway 35 in Los Gatos broke off on Friday. The road remains closed but that hasn’t stopped looky-loos from making the trek to take a look. Neighbors say they do not expect the area to reopen for months. “Obviously, it’s going to be a major job,” neighbor Virginia Becker said. Becker said she was in awe, shocked by the enormity of the gap. Neighbors, like Becker, living along Highway 35 in Los Gatos, also known as Skyline Boulevard, say this level of nature’s destruction was unimaginable before the road and its foundation collapsed on Friday. The crater is at least 200-feet wide and several hundred feet deep. It is located down the street from Las Cumbres road. The sheriff in Butte County, California has ordered an immediate evacuation of all people below the damaged Oroville dam, which is feared to be in danger of imminent collapse, Reuters reports. "Immediate evacuation from the low levels of Oroville and areas downstream is ordered. This is NOT A Drill. This is NOT A Drill. This in NOT A Drill," says the statement posted on the Butte County Sheriff's Facebook page. The statement refers to the Lake Oroville Dam, located 105 km (65 miles) north of Sacramento. The dam's spillway was "predicted to fail within the next hour," the California Department of Water Resources (DWR) said at around 4:30pm PST Sunday (00:30 GMT Monday). "DO NOT TRAVEL NORTH TOWARD OROVILLE," the Yuba County Office of Emergency Services said on Facebook, urging evacuees to travel safely in all other directions and help the elderly. Officials have ordered at least 188,000 residents near the Oroville Dam with no word yet when evacuations will be lifted because of the uncertainty about the condition of the dam's spillway, said Butte County Sheriff Kory Honea. Releases through the dam's main, heavily damaged spillway increased to 100,000 cubic feet per second from 55,000 cubic feet per second on Sunday to try to drain Lake Oroville before a failure occurs, said the California Department of Water Resources. Water falling over the Oroville Dam's emergency spillway has stopped as Oroville lake levels dropped low enough. Lake levels fell for the first time since Saturday and will now allow for inspection of the area. The threat of collapse due to erosion has diminished, said officials at a recent press conference. On Sunday night, state water authorities used helicopters to drop containers of boulders to fill in the 250-foot-long, 170-foot-wide hole in the main spillway to stabilize the problem. The cost of repairing a gaping hole in the spillway for the tallest dam in the United States could reach $200million. Another storm is predicted to hit the area in a few days, which means California's Department of Water Resources will have to continuously monitor inflows into Lake Oroville. Oroville residents returning to their home say they're happy the evacuation order was lifted, but understand why it was imposed. With the crisis at the Oroville Dam stabilized for now, authorities announced Tuesday that the 188,000 people evacuated Sunday will be allowed to return to their homes but should prepare to move again if a new emergency arises. The announcement by Butte County Sheriff Kory Honea, who ordered the mass exodus Sunday afternoon amid fears that the dam’s emergency spillway might collapse, came in a 1:40 p.m. press briefing in Oroville. The sheriff said residents could begin returning home immediately, but he urged them to remain alert for the possibility that an emergency may require another evacuation. Despite that, officials said they are confident that the steps taken to repair the hillside along the emergency spillway – using helicopters to dump boulders into holes and pour concrete on top of the piles – have made the structure safe in the event that the emergency spillway must be used again. They also said such a scenario is highly unlikely, with the next series of storms predicted to be much weaker than previous ones. Authorities also revealed that inspections since Sunday showed that “there was no piping or other erosion that compromised the overall integrity of the emergency spillway” and that action taken to fill in holes and erosion from water releases have strengthened it. Helicopters carried boulders and blocks of concrete onto Oroville's damaged emergency spillway Tuesday in advance of rains predicted for later in the week. There’s another storm bearing down on troubled Oroville Dam, set to begin late Wednesday. But state officials say they believe the precipitation will be mild enough – and the reservoir empty enough – to handle this latest challenge. The crisis at Oroville Dam continued to ease Tuesday. The dam’s heavily damaged main spillway was still able to expel water at 100,000 cubic feet per second, as it has around the clock since Sunday afternoon, with no apparent signs of significant new erosion. For a second day, crews worked to pack the crevice that formed last weekend in the hillside beneath the dam’s crippled emergency spillway, using helicopters and dump trucks to spread a mixture of boulders and concrete over the eroded section. “We’re continuing to make significant gains in removing water from the reservoir, which drops the water surface elevation (and is) further reducing the risk to our situation here,” said Bill Croyle, acting director of the state Department of Water Resources, in an afternoon news briefing. Enough progress has been made that Butte, Yuba and Sutter counties rescinded the mandatory evacuation orders issued Sunday afternoon, allowing an estimated 180,000 downstream residents to return home. “The risks that we faced when we initiated those evacuations have been significantly reduced,” Butte County Sheriff Kory Honea said. All eyes have been on the crisis at Oroville Dam, but weeks of wet weather have put pressure elsewhere on the network of levees and dams protecting cities and farms in California’s vast Central Valley flood plain. Almost all of the major reservoirs that ring the Valley have filled to the point that officials have cranked up releases to catch water from a storm building up off California’s coast that’s expected to hit Wednesday night. Most of the river flows below the dams haven’t exceeded the capacity of the levees that line their channels, and independent experts say California’s flood-control network has endured the exceptionally wet winter rather well. But some levees, including those that protect the Sacramento region, are showing signs of the strain as prolonged heavy river flows push back. The most obvious of those near Sacramento is in the northern Sacramento-San Joaquin Delta. Fearing a dangerous levee-cracking “flood pulse,” workers this weekend intentionally breached a levee along the Mokelumne River in the north Delta. The breach flooded the levee-ringed McCormack-Williamson Tract of farmland near Walnut Grove in Sacramento County. A bit farther south at Tyler Island, crews were working frantically Tuesday to patch a levee in the hopes of saving around 20 homes from being inundated from what officials described as an imminent collapse. On Tuesday, crews used a crane to scoop huge loads of stone from a barge onto the huge crater that had formed in the levee, taking most of a gravel road with it. “The key is we’ve got to get weight on this thing,” said Steve Mello, a Tyler Island resident and a trustee of the local reclamation district. He had no estimate when residents could return to their homes. Mount said he expects more trouble to pop up along Delta levees in the weeks ahead from the continual rush of powerful flows from the estuary’s two primary rivers – the Sacramento and San Joaquin. Mount said the flows from the rivers and tributaries such as the Mokelumne have fueled powerful tides from the Pacific Ocean that are pushing back in the other direction. “The Delta is basically in a hydrological vise right now,” he said. With potentially months left of rain and runoff from melting mountain snow, crews are already working round the clock to patrol the levees looking for breaches along the 70 levee-ringed tracts of land that make up the Delta, said Erik Vink, executive director of the Delta Protection Commission. These tracts are commonly called “islands” because they’re surrounded by canals, sloughs and channels. Of particular concern both in and out of the Delta is the San Joaquin River, which is flowing higher than it has in years. Some buildings along its banks west of Turlock already have flooded. On Tuesday, officials issued a flood warning along the river southwest of Manteca. Meanwhile, a key tributary of San Joaquin River – the Tuolumne River – has strained the regional flood-protection system east of Modesto to the brink. Locals have been nervously watching the precariously full Don Pedro Reservoir. The reservoir, which has more than twice the capacity of Folsom Lake, was less than 3 feet from being completely full on Tuesday. Operators of New Don Pedro Dam have their fingers crossed that the approaching storm follows Tuesday’s forecast: a relatively cold storm that will dump snow in the Sierra Nevada instead of the warm rain and melting snow that could prompt huge releases at the lake. That would overwhelm the small Tuolumne River channel and flood part of Modesto. As it stood Tuesday, forecasts pointed to the lake avoiding such problems for the next 16 days, said Calvin Curtin, a spokesman for the Turlock Irrigation District, which manages the dam. “It will be extremely close, but ... it’s not projected to spill at this point,” he said. Closer to Sacramento, local levees were showing signs of stress, but experts weren’t worried. “Sacramento has a lot of protection,” said Joe Countryman, a member of the Central Valley Flood Protection Board and a former engineer with the U.S. Army Corps of Engineers. He said the region has performed substantial levee upgrades over the years. Sacramento also is protected by a robust system of outlets that spill major Sacramento and American river flows in the massive engineered Yolo Bypass flood plain west of the city. That was evident Monday when crews began emergency work along the Sacramento River to cork three boils that formed along a levee near the confluence of the Feather River north of Sacramento International Airport. Boils form when water seeps under the levee and eventually pushes its way to the land side, creating a small geyser. Local flood officials said they believed they had the problem under control. Dam engineer interview for Oroville dam from Feb 13. A new train of storms has arrived along the Pacific coast, and a potent one is set to hit California hard with heavy rain, mountain snow and strong winds during the latter part of this week. The first storm will focus on areas from Northern California to Washington into Thursday. The second storm in the series will focus most of its moisture on Southern California from Thursday night to Saturday. "The late-week storm has the potential to be the biggest of the winter in terms of rainfall and impact to much of Southern California," according to AccuWeather Meteorologist Jim Andrews. The storm will bring enough rain and excess runoff to cause flash flooding, which can cause major delays for motorists. Along with the heavy rain will be the potential for mudslides in some neighborhoods, especially in recent burn scar locations. "We expect 3 to 6 inches of rain to fall in the lowlands along the coast and over the Los Angeles basin," according to AccuWeather Senior Meteorologist Ken Clark. "From 6 to 12 inches of rain is likely below snow levels in the mountains, especially along the south-facing slopes." Another storm will roll ashore from the Pacific during Sunday night. However, most effects from the storm will be focused from Northern California to Washington during the first half of next week. As a result of the ongoing storms, more challenges are ahead for crews, officials residents in the Oroville, California, area. Damage to the spillway at the Oroville Dam forced evacuations earlier this week. Rainfall from the storms through Friday have the potential to aggravate the situation around Oroville and other reservoirs filled to capacity in Northern California. Additional rainfall will force officials to release more water downstream. Some of these rivers are already at flood stage. The rainfall to end this week will take another big chunk out of the drought over Southern California. Total rainfall since Dec. 1 over much of Southern California has ranged from 1.5 to 2.5 times that of average. Crews are working around the clock to shore up the Oroville Dam’s emergency spillway, as several inches of rainfall are expected through next week and could threaten the beleaguered reservoir. A trio of storm systems are set to barrage Northern California over the next couple of days. The first started Wednesday night and rain will continue until at least Tuesday, Feb 21. Forecasters are confident that the dam can handle the first two storms, but the third could be trouble, as it is expected to be the largest, and warmest, of the three. "The third wave is looking like our problem child," said Michelle Mead, a warning-coordination meteorologist at the National Weather Service in Sacramento. Oroville Dam is America's tallest dam, and the twentieth tallest in the world. The 40-year-old dam saw a hole form on Saturday in its emergency spillway, due to erosion and mismanagement. Fears that the entire dam could fail led to the state to evacuate nearly 188,000 downstream Californians. After several days of emergency repairs, including a fleet of helicopters dropping stones into the spillway hole, state authorities allowed evacuees to return to their homes on Tuesday. The state continues to work to repair the dam's spillway, moving an estimated 1,200 tons of rock every hour into the spillway. The rain will slow the repair efforts, however. Wet, muddy conditions will threaten heavy machinery and workers on the ground, while strong winds may ground helicopters. However, engineers are confident that the dam will hold through the storms. On Wednesday, authorities in Butte County (where the dam is located) filed a petition with the Federal Energy Regulatory Commission to require the state to address the dam's deficiencies. "Butte County and others have warned of the potentially catastrophic consequences of DWR's [California Department of Water Resource] failure to adequately address dam safety issues at the Oroville Project, and we are now facing the consequences of DWR's short-sighted approach," Butte County counsel Bruce Alpert wrote. Butte County, as well as other county governments and independent environmental groups such as the Sierra Club, urged the state to inspect the dam as far back as 2005. They were concerned that the dam could fail in the event of heavy rains due to erosion. The DWR repeatedly rebuked these claims. I had the same thoughts - maybe "California falling into the ocean" can happen from another direction - from inside. After so many years of drought nobody thought that one day the waters will flood the arid lands and soak them beyond capacity, even if there were some warning signs lately. **Water Weight** triggers quakes near damaged Oroville Dam! These three graphs show key California reservoir conditions and river stages for the upper and lower Sacramento Valley. The images are from the California Department of Water Resources’ Data Exchange Center and the National Weather Service. After four days of relentless pounding on Oroville Dam, its operators dialed back water releases on the heavily damaged main spillway Thursday, even as forecasts show another “atmospheric river” poised to strike the region early next week. At 2:21 one can see the sheer volume, and the energy being released @ 100,000 cfs. As California continues a massive recovery effort from the damaging impacts of storms in December and January, and with the recently authorized resources from FEMA, activity has is picked up the pace at Cal OES headquarters. The Lake Oroville Emergency Spillway incident is just one in a series of major weather-related issues being coordinated out of the State's Emergency Operations Center in Sacramento. It's critical local, state, federal and non-governmental partners are working together to ensure the readiness for all possibilities. Shawn Boyd has the very latest information in this Cal OES In-depth report. “We are locked at the hip,” Tim Scranton, the FEMA Federal Coordinating Officer, continued. Scranton says their focus is maintaining situational awareness and supporting the state. Last weekend, water in the Oroville Reservoir was rising rapidly, eventually coming over the emergency spillway, causing severe erosion and concern for the state and dam operators. The California Department of Water Resources is also here, setting up a resource center and giving quick access to accurate, reliable information and subject matter experts. A contingent of emergency managers led by Ghilarducci as well as CALFIRE Director Ken Pimlott, California National Guard Adjutant General David Baldwin and Department of Water Resources Acting Director Bill Croyle met with local officials in Oroville on Wednesday. Work continues with 95 contractors laboring by air and land, dropping rock and concrete into the gaps to fill the voids caused by water escaping the controlled spillway. Drier weather has allowed DWR to reduce water releases from 100,000 cubic feet per second. Beginning at 9AM Thursday, they dropped rates by 5000cfs every two hours and will that hold once they hit 80,000cfs. That decision considers the heavy rain that’s expected to drop over the next several days. Cal OES, FEMA and the Unified Coordinating Group continue to closely watch developments at Oroville Dam and to support DWR. They’re also working to prepare contingency plans for those impending storms statewide. For more up-to-date information on efforts in Butte County… be sure to go to _http://caloes.ca.gov/ and click on the Oroville spillway emergency banner for access to our Oroville spillway incident resource page. Residents are urged to sign up for emergency alert systems. Big rigs filled with emergency supplies from FEMA have been arriving at Travis Air Force Base since Wednesday night. Hames’ job is to help coordinate this partnership between the Air Force and FEMA. “FEMA has requested to use the Air Force base as a good community partner to assist in providing space, so they can stage their vehicles and supplies here, so they're immediately ready to help the public when needed,” Hames said. “They don't want to be caught too late to the fight, if you will, to get the supplies and such there." As the trucks make their way onto the base, they're checked in and accounted for by FEMA crews before getting parked and staged in case they need to be sent to Oroville. “We’re working really closely. We're embedded with our state partners. We're monitoring the situation at the Oroville Dam Spillway in case more federal assistance is needed,” external affairs officer for FEMA Region 9 Veronica Verde said. The mobilization comes two days after President Donald Trump approved Gov. 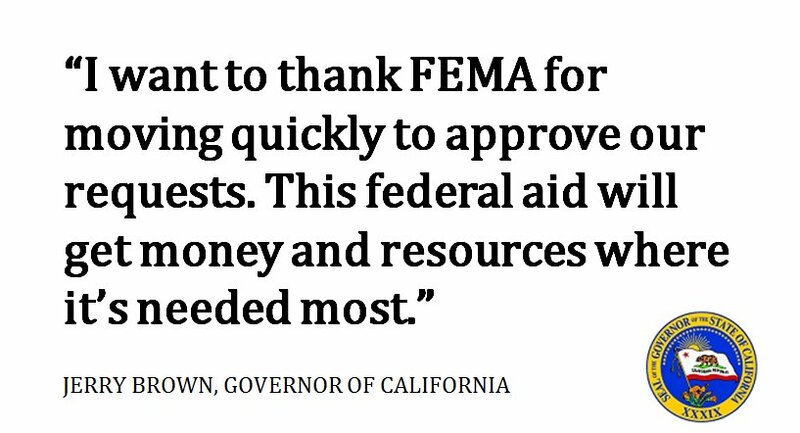 Jerry Brown's request for a federal emergency declaration in Oroville. At least 44 trucks and more than two dozen personnel from FEMA are expected to arrive at the base through Friday. “We'll move them as quickly as we can, as soon as the state says there's a need for them,” Verde said. With the emergency declaration approved, the state will now be responsible for only a quarter of the costs of these supplies. FEMA will pay for the other 75 percent. But officials hope none of the trucks have to be deployed to Oroville. “We are all hoping and keeping our fingers crossed that we won't use any of them and everything stays normal,” Hames said. Officials at Lake Oroville reduced the rate of water release once again Friday as workers continued make repairs to a damaged spillway and clear debris from a hydroelectric plant. State Department of Water Resources engineers will decrease the flow of water in the Oroville Dam's main spillway from 80,000 cubic feet per second to 60,000 by Saturday morning, giving crews space to dredge debris from a pool at the bottom of the spillway, said DWR acting director Bill Croyle. Engineers had been pumping water out of the lake at 100,000 cfs for several days to make room for incoming storm runoff and to keep the lake from overflowing like it did over the weekend. That overflow badly eroded an emergency spillway and sent debris flowing into a pool at the bottom, forcing the closure of an underground hydroelectric plant. “This reduction in flow will allow us to work on the debris pile in the spillway,” Croyle told reporters at a news conference. He estimated that 150,000 cubic yards of sediment and debris were in the pool. The other focus by workers at the dam is the eroded emergency spillway, Croyle said. Rain began falling again in the area on Thursday and it’s not expected to stop until the middle of next week at the earliest. The heaviest showers are expected Monday and could drop up to 10 inches of rain onto the mountains and foothills that drain into the reservoir, the National Weather Service said. The storms aren't likely to produce enough runoff to exceed the lake's capacity, Croyle said. Hundreds of thousands of tons of rocks and concrete slurry have been dropped into four fissures that threatened a retaining wall of the emergency spillway on Sunday. They were 50%, 75%, 90% and 100% full, respectively, Croyle said. Rain falling onto the slurry and a small stream that had formed on the hillside Friday did not worry DWR engineers, he said. Citizen journalist, Sean Dennis, has been making videos to keep the public updated on the situation at the Oroville Dam. While reporting in this latest Periscope video, he was informed that the sheriff’s department was looking for him because of his coverage.